Sportingbet Casino 10 Free Spins on Starburst - No Deposit Required! 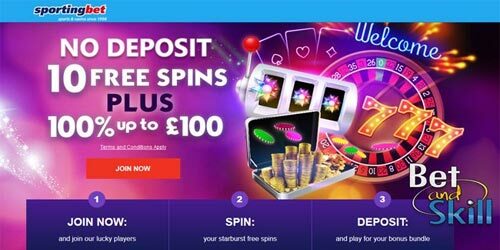 SportingBet Casino are offering 10 no deposit free spins on Starburst, a bonus available to all new players registering an account via this page. Plus, new depositors will obtain a 100% bonus up to £100! Enjoy one of the best online casinos without deposit! You can play on Starburst slot from your mobile or desktop PC. SportingBet Casino 10 no deposit free spins on Starburst! 2. Open a new account with SportingBet Casino in few simple steps! 3. Get 10 no deposit free spins on Starburst and start playing for free!! 4. Deposit & get a 100% match bonus up to £100!! Sportingbet Casino is one of the oldest and mujst trusted operators in the gambling industry, offering one of the most appreciated online casino. It is available in a wide range of countries (including UK) and some 22 languages. Online selection of games is really great and includes video poker, new games, instant casino games, promotions and more. You can enjoy the real abundance of online casino games including Ash Gaming, Betsoft and NetENt Slots, Blackjack, Baccarat, Caribbean Stud Poker, Casino Hold'em ,Virtual Dogs and many others. Anyone worried about safety and security should seriously consider heading over to SportingBet, as they hold gaming licenses from three different respected authorities, including the UK Gambling Commission. The Free Spins are to be played on Starburst slot (PC and/or mobile) and are credited instantly upon registration. Any funds gained from the Free Spins will have a 50 x wagering (to be completed on qualifying slot) requirement before any funds can be withdrawn. You will have 72 hours to do so. Any unused or unredeemed bonuses will be removed, along with any winnings attributable to them. When you have normal funds and bonus money in your balance your normal funds will be used first. The Welcome Bonus is a 100% Match based on a New Customer’s 1st deposit and play at SB Casino or SB Games. To qualify for the 100% Welcome Bonus, a minimum of £10 must be deposited and wagered at SB Casino or SB Games. The maximum bonus applicable will be £100. The 100% Welcome Bonus offer will only be available to players who wagered their deposit at least once, therefore you need to stake your deposit 1 times to be eligible for receiving the bonus. If the deposit is not wagered 1 times within 00:01 CET to 23:59 CET on the same day as your first deposit, no bonus will be awarded. Examples: If you deposit £25 you must wager this £25, if you deposit £100 you must wager it £100 to be eligible for a bonus. The maximum 1st Welcome Bonus is £100, the minimum is £10 (multiples of £10 only). The 100% Welcome Bonus will be credited within 48 hours of a successful 1st deposit and wager of £10 or more. Only wagers made within the same calendar day (up until 23:59 BST on the day of your 1st deposit) will qualify. Only wagers at Sportingbet Casino, Sportingbet Games and Sportingbet Live Casino will qualify. You have 48 hours from receiving your bonus to complete a minimum 50 x wagering before these funds are removed and only the remaining original balance will be withdrawable. E.g. If you stake £250 on slots, then £250 (100%) will contribute towards your £250 stake requirement before you can withdraw your bonus and any winnings. If you stake £250 on Roulette, then £50 (20%) will contribute towards this stake requirement etc. No minimal risk wagering on roulette will count towards stake requirements on this promotion. Players deemed to be using minimal risk wagering tactics to accumulate bonuses from this promotion will have their account locked until further notice and bonuses / subsequent winnings removed. Players cannot bet more than 20% and a bet limit of £25 per wager applies of the bonus amount in a single bet or game round on any of the casino games for the duration of the bonus (except for doubling, taking insurance and splitting in blackjack, whereby this rule is exempt). Failure to comply will result in the bonus amount and winnings being removed. Please note: there are no restrictions on game play in real time, and this condition will be reviewed only on player withdrawal. "Sportingbet Casino 10 Free Spins on Starburst - No Deposit Required!"